At the moment I am wading through tons and tons of organic food. Which is nice work, if you can find it but essentially I have agreed to take part in a campaign run by Organic. Naturally Different, an EU funded project that seeks to promote..... you've guessed it, organic food. 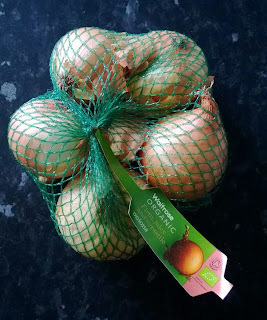 Now believe it or not, I do have some strong opinions about organic food and have been formulating the pros and cons in my head ever since the nice man from Ocado delivered and dumped a load of shopping bags on our doorstep. But I have to be honest though, I am having problems with presenting a cohesive argument that clearly expresses my attitudes towards organic food. It's like I have got the proverbial angel and devil on my shoulders and they are spitting blood at each other. "It's better for the planet Danny." "Piss off, it's too expensive." "But think of the animal welfare." "Stick it up your arse! It's too bloody expensive." To be fair, I am leaning towards the more positive angle (or angel rather). I have not had an epiphany as such but the little voice urging me to make wholesale changes to the way I shop and buy food is getting louder and louder. At stake though is the simple fact of pure economics and personal finance, as it is with most people in this country. The cost of food is becoming a bigger and bigger issue these days. Coupled with the haves and have-nots, the maelstrom that is building, particularly in the media has been messing with my head. I have had nosebleeds thinking about it all but I will write about this again. I have to. In the meantime though, in true indomitable FU style, I would like to discuss the matter of flatulence and a recent glaring and somewhat sulphurous observation. If I decide to make a concerted effort to try and buy more organic produce, am I prepared for the eruptions that will surely follow? Could we, as a family, suffer another catastrophic Saturday afternoon like last week? Am I prepared to ever endure that seething stench, ever again. Because Holy Mother of God, organic onions really make you fart. 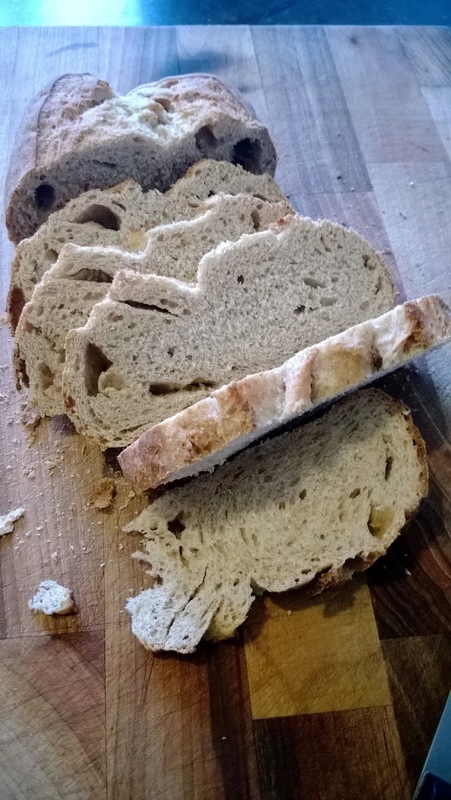 A regular treat in our household is a plain old panade, a dish that comes in many guises but the principle ingredient is stale bread. Used to soak up the juices from a broth or perhaps glue together something more substantial like meatloaf, the bread normally forms the heart of something that is rustic and frugal. 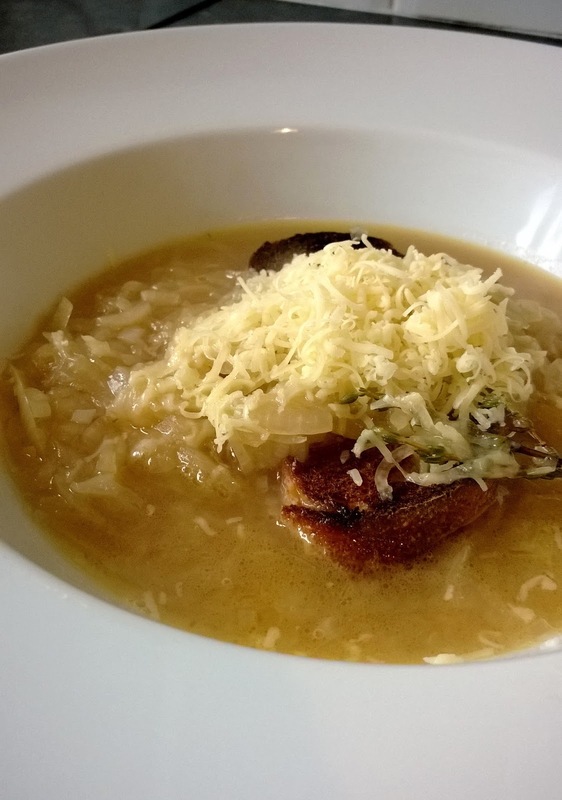 Being a big fan of Skye Gyngell and her book A Year In my Kitchen, I like to use her recipe of slow cooked onions, ladled over leftover bread, with added stock and grated cheese to make a hearty lunch on rainy afternoons. Over time, I have made changes of my own to the recipe. I cook the onions for a lot longer and I occasionally use beef stock rather than chicken and instead of brandy, I've been known to wastefully add a splash of Lagavulin. We like it and the kids love it. 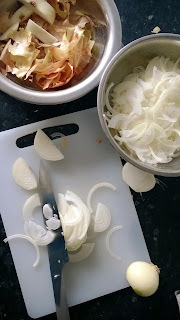 Now onions are well known for their gaseous properties and as the solid base for many a meal, they are often the cause for the odd slip of trumpet or buttock wobbling guffage. "Oof, excuse me, them onions eh!" Faces turn red. We laugh, titter and sigh. But then we soon get over things. However, like I said, on Saturday, it was like the Grimethorpe Colliery Band had come trampling through the house. The twins, as always, took great delight in their rumblings. When you are 5 nothing is quite as funny as a fart. Parp. Poompth. Fuuurt. Bllffffftht. All wondrous noises and watching a child giggle with delight is even more wondrous. But when the foul stench of Hades is emitting from your daughter's bottom as she sits on your lap, well things don't become so hilarious anymore. I am still quite the child at heart and whenever the chance arises, I love doing a comic turn of controlled fluffing in the manner of Reeves and Mortimer's characters Le Corbussier et Papin. But when you can't control things, it all becomes quite disturbing. My wife will kill me for saying this but she has never been shy in the whizzpop department. I think she let rip on our third date. Yet when the onions began to weave their interminable colonic magic, she laid the finger of blame squarely at me - "Danny! What the f*ck did you do with those onions?!" It really was a horrific episode and no matter how many windows were opened on that cool autumn eve, the house still oozed with a perpetual, lingering miasma of rotten egg and boiled cabbage. So much so, that even writing this makes me feel kinda woozy thinking about it. The twins on the other hand want to know when Daddy is going to make 'fart soup' again. So for the future, as well as considering the ethical and financial implications of organic food, I am going to have to take into account the physiological impact too. Because I swear that Tesco's Value Onions have never, ever done that to us before. Melt the butter in a heavy-based saucepan over a low heat. 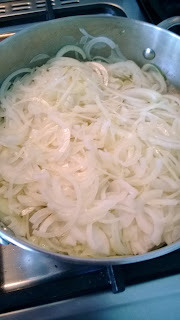 Add the onions, sprinkle with sugar and add a pinch of salt. Sweat gently for at least 45 minutes until very soft. The onions will become deep in colour as they caramelise. When the onions are really soft, add the whisky or brandy and increase the heat to reduce and burn off the alcohol. Add the herbs and the beef stock. Reduce the heat to a medium and cook for another 10 minutes or so until the stock has reduced slightly. Remove the herbs. 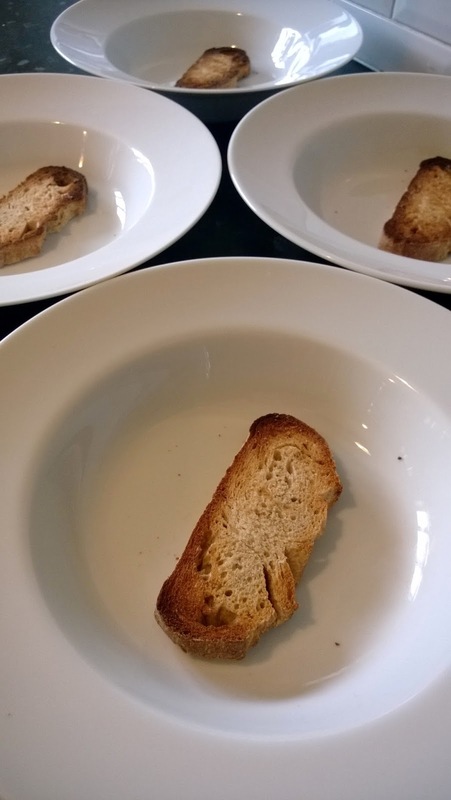 Toast the slices of bread and rub with the garlic clove whilst still hot and place them slices into warm bowls. 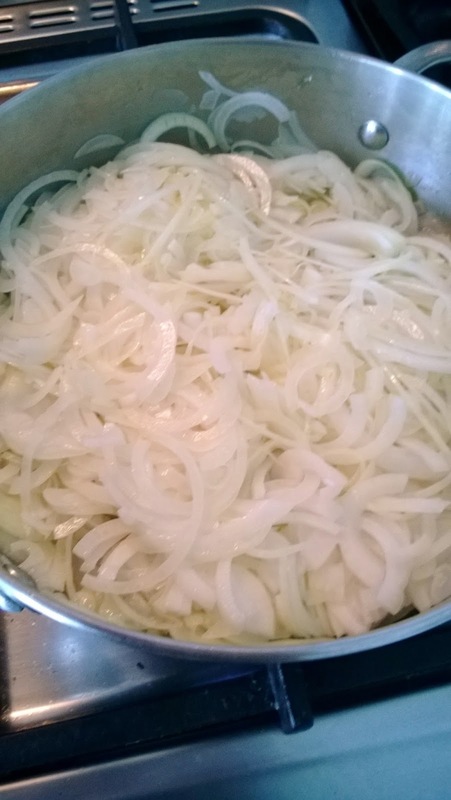 Ladle over the onion brother and sprinkle with the cheese. Finish with a healthy grinding of black pepper and serve piping hot. *Of course, after reading about the inherent dangers of onions, you might not want to cook this. It is very nice though so perhaps you should also purchase some pegs when shopping for the ingredients. And remember, organic is best. I'd quite like a fartless version of that post - I can't read the recipe because I am laughing too hard. i kind of agree with you re organic food... I want to do it but i'm much keener of shopping local than anything really... lovely ionionionion soup. Ah, so it's the onions I need to blame then!